Grease is stickier than I thought – BG Products, Inc.
From the moment my father first taught me how to grease our farm equipment back home, and through all the years of working as a technician, grease was just that thick stuff you found in a tube or tub. When your grease gun was empty, you just found a new tube and plopped it in! That’s it; so simple. Sure, it can be that simple. But what I didn’t realize is that I hadn’t even touched the greasy surface. Working at BG, I’ve learned there is much more to grease than I once thought. The one thing I did know was that grease is an alternative to oil. It holds lubricants in place, seals out contaminants, supports heavy loads in extended wear areas, suspends solid additives and it’s great with less rigorous seals. So what is so special about grease? Lubricating grease is a solid or semi-fluid product of a liquid oil lubricant with a thickening agent. These thickening agents are what make grease so… well, greasy. It is the thickeners and additives that give grease its designation for particular usage. Most greases are made up of 85 percent oil with a thickener and an additive package. The type of additive/thickener package is what differentiates one grease from another. It also determines such factors as stability, oxidation resistance, water resistance, compatibility with other greases, operating temperature range, oil separation and cost. Which grease goes with what? BG’s family of grease products covers a broad range of select application use. Our new BG Grease Application Guide (available on BG Nexus), helps simplify those tough application questions out in the field. 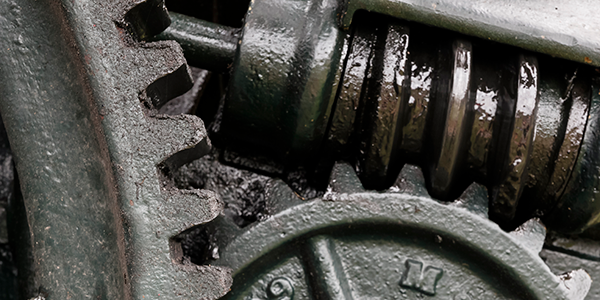 BG Premium Lubricating Grease with RF-7, PN 600, is perfect for high pressure load areas such as open gears, splines and pivot pin areas where temps do not exceed 250°F/120°C but is also able to handle wheel bearing applications. For higher temp applications use our other dual purpose greases. BG Special HCF Grease, PN 605, for construction and agriculture duty, enclosed gearboxes or wheel bearings—where chemicals, water washout, or corrosion may occur. 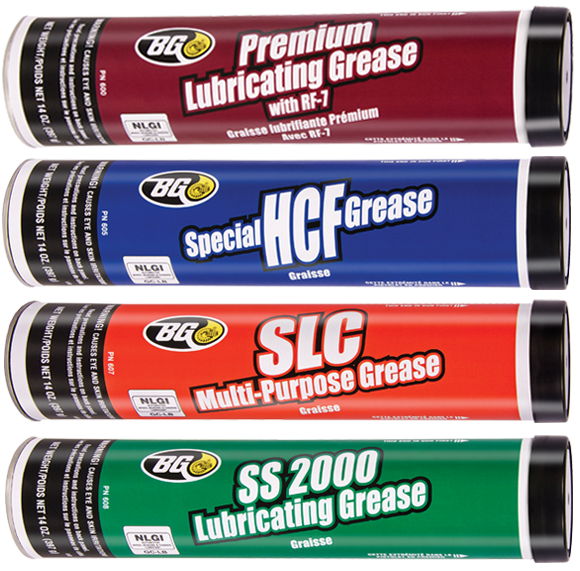 BG SLC Multi-Purpose Grease, PN 607, with its Lithium Complex thickener, works well for general automotive use and “on road” wheel bearing packs. And, BG SS 2000 Lubricating Grease, PN 608, polyurea-based formula is the favorite for its ability to perform the necessary “Fill for Life” areas such as CV joints, electric motors and high speed bearings that do not encounter moisture. All four greases are National Lubricating Grease Institute (NLGI) rated GC-LB for dual service use in chassis and wheel bearing applications. See how sticky grease can be? With the BG Grease Application Guide selecting the right product for the right application is simpler than ever! So the next time you see a technician plop that new tube into his grease gun, you can advise him to be a little choosier with his selection. Your customer will be reassured that you know exactly which grease will do the best job for his customers’ vehicles.